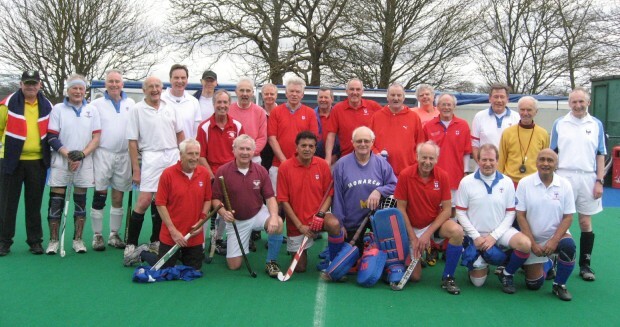 Keith Hunt, our hard working Membership Secretary and Club Communicator, organised another one of the now very popular Intra-Club games on a sunny afternoon at Reading Hockey Club’s superb water-based pitch. It is hoped that more Intra-Club games can be organised by members throughout the year. For the record the results were LX ‘A’ beat LX ‘B’ 4-1 and also LX ‘C’ 2-0, whilst LX ‘C’ beat LX ‘B’ 1-0. All games were 35 minute sessions. Many thanks go to the three umpires involved, who excellently managed the games with skill and understanding. Particularly, thanks go to Keith Hunt for setting up the fixture, supported by Elaine, who arranged the very enjoyable after-match meal. In attendance were fourteen wives/partners, who gave strong encouragement to all the players detailed below; plus young members from the Reading HC ‘Hockey Camp’, who gave strong vocal encouragement to their elders! Team ‘A’: Trevor Denison (Capt), Alan Dures, Geoff Ash*, Colin Pinks, Mike Sprange, Brian Stokes, Peter Danson, David Brampton, Bill Warrender, John Land, Gordon Small, David Van Beesten*. Team ‘B’: Alan Jackson (Capt), Mike Fripp, Brian Tubb, Geoff Furneaux, John Longden, Frank Hardy, Richard Clarke, Gilbert Grace, Pami Bolina, Graham Martin, Bob Grenside, Peter Curtis**, Peter Ross. Team ‘C’: Mike Surridge (Capt), Andrew Bowyer*, David G. Read, Sudesh Nayar, Steve Branston, John Tripp, Mike Brown*, Geoff Lucas, Adrian Money, Rod Cochrane, Graham George, Henrik Kjellin**, Keith Montgomery. * Reading HC Masters, ** Guest players. Umpires: Richard Bisley, Chris Jones, Keith Hunt.